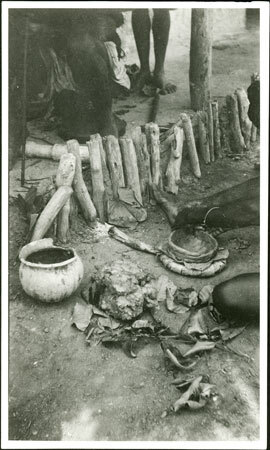 A potter (just visible, identified as Iowa) making a pot at the compound of Badinda (a local governor), moulding strips of clay onto a base, laid out on a large leaf and ring to keep it steady. A pot of liquid and a lump of clay are nearby. The legs of Badinda can be seen seated on a stoop above him, as well as Mekana, Evans-Pritchard's servant. Notes on print/mount - "making pots at Badinda's 72/3 2 EPA689"
Notes on card mount m/s pencil - "SSS overall (worst upper LHS) 'making pots at Badindas' 8.89"
Morton, Chris. "Zande pot making" Southern Sudan Project (in development). 03 Jan. 2006. Pitt Rivers Museum. <http://southernsudan.prm.ox.ac.uk/details/1998.341.689.2/>.